I looked through my pile of blocks last week and realized I only had about 2 with red fabrics in them! I guess I need to do a bit of stash-building in that area. I found a couple of good reds in a Love is in the Air layer cake I have though, and I like how they turned out. More orange, too. I only need to make 11 more 9-patches and then I'll be ready to put this quilt together. It's going to be so cute! I'm linking this over at Sew & Tell Fridays--go see what other people have been working on, this week! I always love 9 patches... Orange, yes... more ORANGE! love the orange swirley's up top and the little red and white paisley. Great combo's! My favourite is the center red one. Lovely work. There are some great fabrics in your blocks. 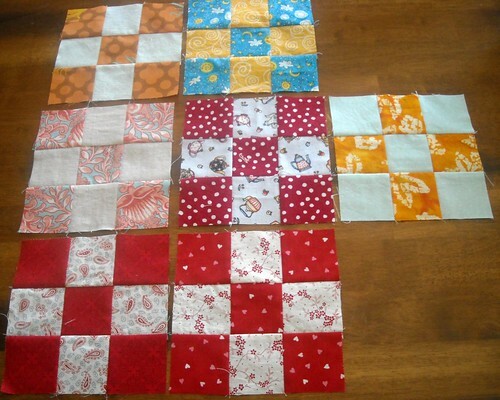 Great blocks this week, those reds will be so pretty in the finished quilt! My stash, too, is red-deficient. I like the fabrics you've chosen. Happy piecing! I love 9 patch blocks. I have some of those fabrics you have in there, too.